Hurricanes Harvey and Irma did quite a bit of damage to cotton in the South. According to Growing Georgia here, cotton growers in Georgia sustained at least $100 million in damage from Irma, resulting in at least a 10 percent loss due to the storm, although amounts could go higher once the final tallies are in. 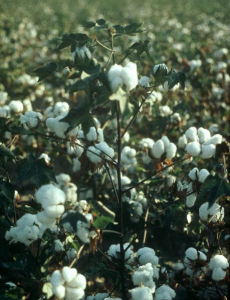 However, in spite of these losses, overall the cotton crop is in good shape due to extra acres planted this growing season, according to the Farm Journal here. That also means there will be adequate supplies of cottonseed for livestock feed. Posted in Climate and Ag in the news, Crops, Livestock, Tropical weather. Bookmark the permalink.